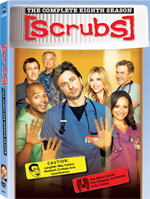 Scrubs had a good run, and then it got extended, and then once again got another reprieve. But now, after 8 seasons, it looks like the series will finally be allowed to retire. There’s gossip about a new set of Scrubs worn by a new batch of interns, but for me, I’m happy to send a fond farewell to JD, Elliot, Dr. Cox, the janitor, and the rest. Season 8 is a lot like the others. Perhaps because of lowered expectations, it seems is more solid and funny than I had expected. Maybe because the writers and cast knew it would be the last season, they worked extra hard. In either case, it’s a pleasant surprise for what I feared would be a half-hearted execution on a show that’s past its prime and on its way out. So what’s new in Season 8? Well, instead of stills over the end credits there are outtakes. There are some character changes — Bob Kelso seemed to have been written out of the show but he lingers on. His replacement stuck around for a couple of shows and then disappeared. The on-again, off-again relationship between the two lead characters flips the switch yet another time. And some of the interns introduced early in the season make recurring appearances (fueling the rumors of a spinoff). But in spite of any “new” changes, Scrubs is still the same old show. It is comfort food. What it lacks in originality it makes up for in warmth and familiarity — it’s filling if not exciting. As with previous seasons, the 3 DVDs are packed neatly in a colorful case. The extra features are very similar: there are deleted scenes, alternate lines, and bloopers. There are also some new extra features that you didn’t see on previous DVD releases. The first of the two new features is a short documentary (maybe 30 minutes) about shooting the final episode in the Bahamas. Creator Bill Lawrence’s parents live there, and while trying to think of a gimmick episode for this last season — like the fantasy episode or the musical episode — they considered taking the cast and crew to the islands. The documentary reveals that the trip was a very fond farewell — they took to calling it their ” senior trip” before everyone graduates and goes their separate ways. The documentary is a nice trip for long-time fans, too, a little peek into the camaraderie that has built over the last 8 years. There are audio commentaries, too, but having been burned on previous releases, I skipped mine. There’s not much to say. The final season kept its 4:3 aspect ratio. The picture and sound quality are very good: no surprise there as the source is all new and well produced. Watch the episodes, of course. Somewhere in-between, watch the bloopers (why not? ), and if you can pick them out, the alternate lines that involve Neil Flynn. Don’t miss the documentary on filming in the Bahamas. And if you do watch the audio commentaries and they actually got better, let me know. Skip the webisodes unless curiosity gets the better of you.